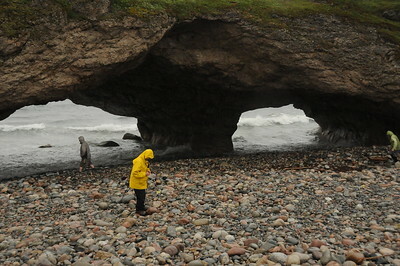 We were celebrated with light rain and very gusty winds during our departure of Cow Head this Wednesday, June, 25th. 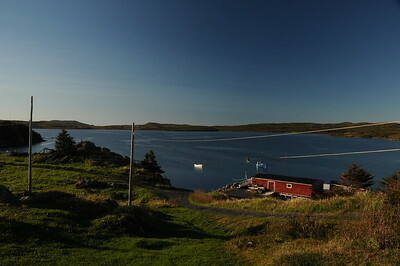 Following the shoreline along Route 430 our destination today is Gunners Cove for our next two nights sleep-over. Forty-five minutes up the road and our first pull off is at Arches Provincial Park, which will be a brief stay due to the weather. But all is not doom-and-gloom, interesting things are to be discovered further up the road, and the weather is going to clear as well, which makes for excellent iceberg viewing. 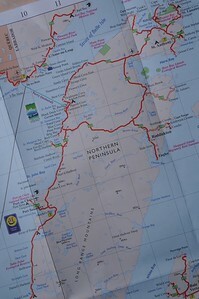 Just do to the nature of following the coast line, there are loads of opportunities to stop, step out of our vehicles, and go on mini explorations. 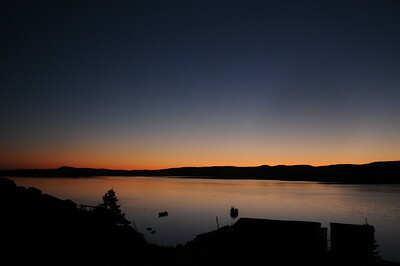 And it wasn't until nine hours out of Cow Head did we pull into Hillsview B&B in Gunners Cove. Tomorrow we visit L' Anse aux Meadows, which has been designated as a UNESCO site, and is "thus unique evidence of the earliest known European presence on the American continent." 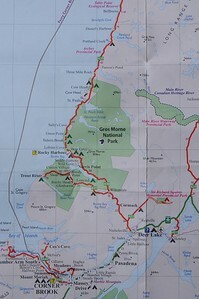 The next morning we left Cow Head and Gros Morne National Park in a driving rain, with our first planned stop at Arches Provincial Park, a mere three quarters of an hours drive up Route 430. Although it does not look too nasty from this photograph, our rain gear did serve us well against the high winds and constant rain. 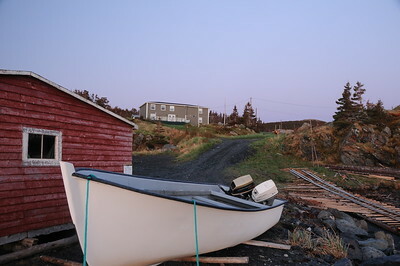 We decided to put off any further exploring at this time but will pay the Arches another visit on our way back down from Gunners Cove a few more days from now. 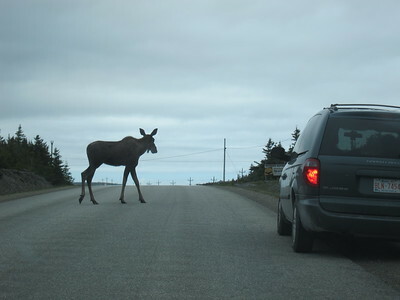 This moose was in absolutely no hurry to get to the other side. 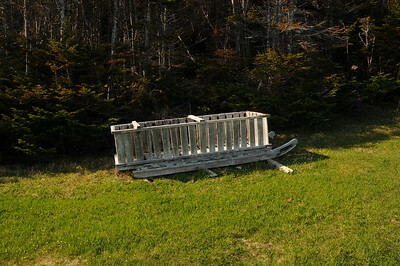 The Newfoundland Government sells permits to land owners for the permission to cut trees in designated areas. 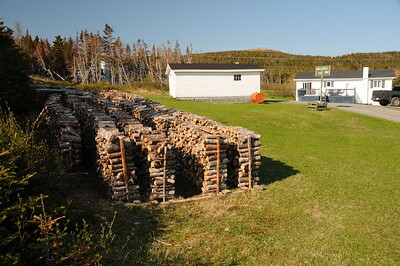 Every pile stacked has the permit number attached to it. This sleigh could very well serve many purposes. 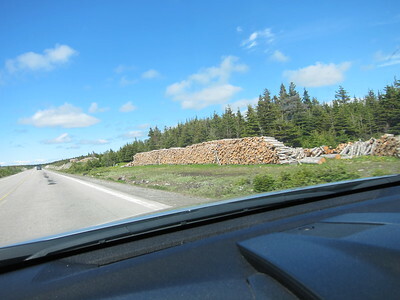 One purpose for sure is to haul wood during snowy months from the owner's permit-cut pile on the highway. This took a bit of doin', I'm thinkin'. 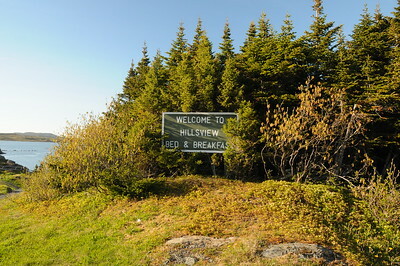 Continuing north along Route 430, the speed limit varies in places such as, River of Ponds, Plum Point, and Nameless Cove. 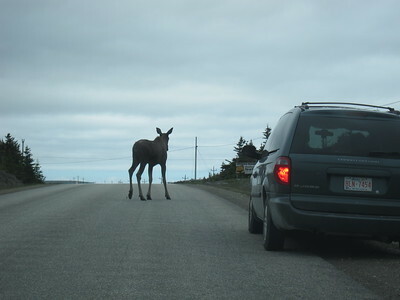 30, 50,and 60 kph are the norm. 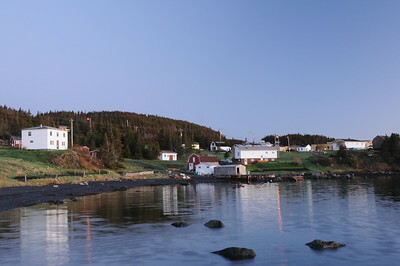 St. Barbe is the seasonal ferry terminal for people and vehicles crossing over to Blanc-Sablon, Quebec, with the Labrador border being only minutes away from Blanc-Sablon. 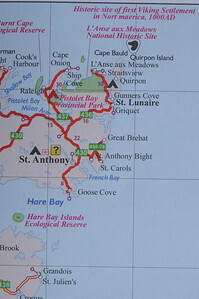 St. Barbe is also the harbour where we all saw our first closeup view of an iceberg--which was a genuine thrill. 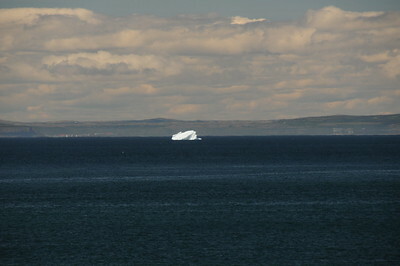 Every year about 40,000 icebergs are born in Greenland, but only 400 to 800 reach St. John's NL. 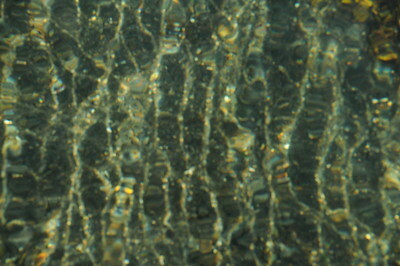 This iceberg and all to follow, originated from Western Greenland almost two years ago. Once they separate from the Greenland ice sheets, the bergs drift through the Davis Strait, latch onto the Labrador Current, and sail into "Iceberg Alley." On the way through St. Barbe, we stopped for a photo of this iceberg passing through the Strait of Belle Isle, with Labrador in the background. 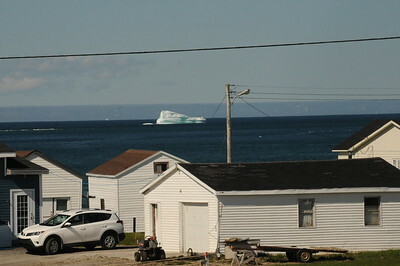 During the iceberg season, some of the white giants make a turn into the Strait of Belle Isle, in the western waters off Newfoundland, instead of the usual route down the east side known as "Iceberg Alley." 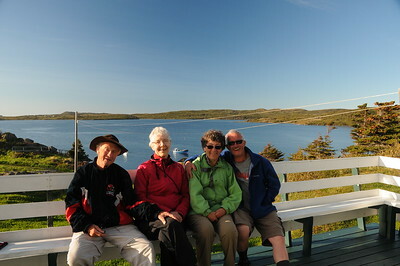 With our day full of iceberg watching, the four of us pretty much travel non-stop until we arrive at our next two nights sleep at Hillsview Bed and Breakfast in Gunners Cove, next to St. Lunaire. 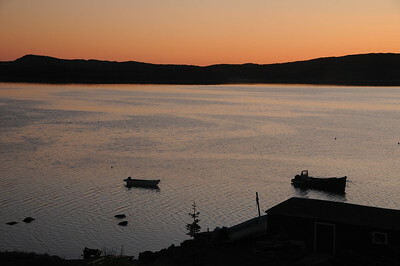 An evening view of Gunners Cove from our back porch. 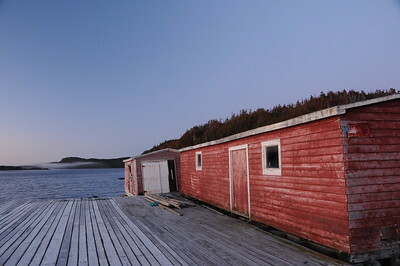 The sun rises early on the north-east shores of Newfoundland, and at 4:15 the following morning, the conditions were ripe for a few photographs. As the minutes passed, my surroundings grew brighter. 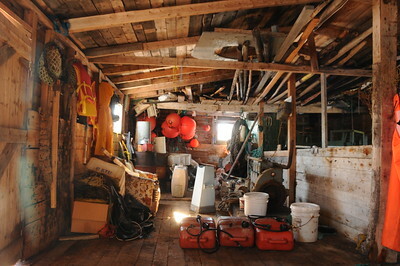 This fishing shed is begging me to enter, and have a look around. The air is crispy-cool and my fingers are starting to slow down so I'm heading back up. Sharon and my bedroom window is on the top floor and third from the left. 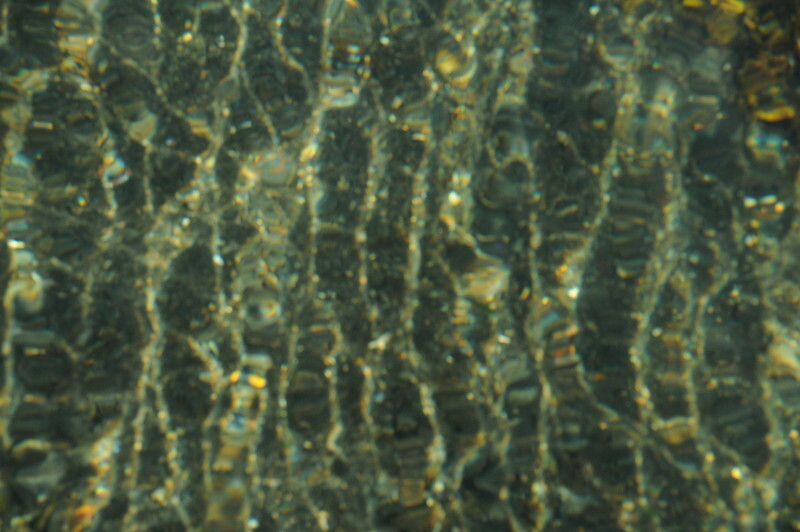 I am attempting to photograph the lobster trap camouflaged within the shadows beneath the water, but it did not turn out all that well, so I settled for an abstract picture instead.